Brazil’s President is likely to move the South American giant even closer to the BRICS and set the path for a new world order. The just-concluded presidential election in Brazil was probably the most watched South American political spectacle in Russia, India, China and South Africa. 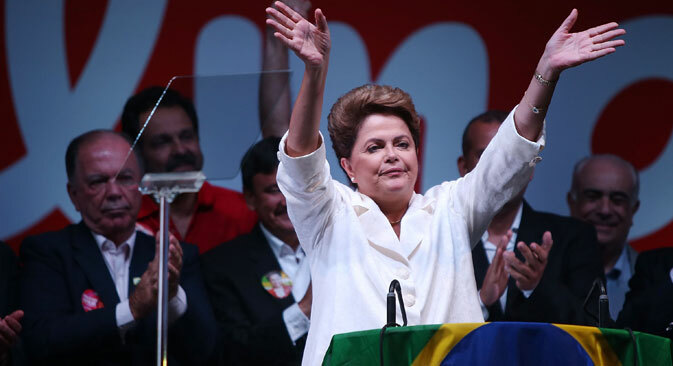 The incumbent, Dilma Rousseff is a popular figure in the BRICS countries, for her policies and enthusiasm towards the grouping and more so, for her success in poverty and inequality reduction in Brazil. She followed in her predecessor Luiz Inácio Lula da Silva’s footsteps and continued and improved policies that have reduced poverty in Brazil by 55 percent since 2003. The story of the Brazilian election was carried out well by the international media. This was the case of a former guerrilla imprisoned and tortured by a military dictatorship (that was put in place by the United States!) fighting for re-election against a privileged individual from a political family who wanted to push the country right back into the arms of America. Aécio Neves, the challenger in the elections, posed the greater danger to BRICS as we know it. His choice for Brazil’s finance minister hinted that there would be a complete privatisation of banks in Brazil and by default some sort of about turn even on the BRICS bank. In fact, Neves’ platform during the election was a closer relationship between Brazil and the U.S. and EU, definitely at the cost of BRICS and regional groupings such as Mercosur. Essentially Neves was looking to change leftist policies and reorient the country towards the United States, a country where corporate greed and interests dictate policies and the gap between the haves and have-nots are widening at an alarming pace. In case Neves won, there was a great chance that former São Paulo governor José Serra, a critic of Vladimir Putin and Xi Jingping, would have been appointed the foreign minister of Brazil. One would shudder to think about his views on the BRICS! The greatest strength of BRICS is the fact that the leaders of each member are dedicated to the objectives of the grouping, which are increasingly becoming strategic as opposed to just economic. Russia was probably the biggest initiator of the grouping, but the idea of BRIC and then BRICS has been received with much enthusiasm in each member country. If Brazil pulled away, the organisation would have become another toothless tiger, and basically lost its relevance. Now, with all five countries having stable governments with leaders dedicated to the grouping, we can expect further cooperation. “We are responsible for the mitigation of the financial crisis and the sustainable growth of the world economy since then,” Rousseff said once the BRICS Bank and the $100 billion contingency reserve fund were launched at the last BRICS summit in Fortaleza. The BRICS and its new institution will have to be at the forefront of a movement to reduce international dependence on Bretton Woods institutions. Those who think that the BRICS is a purely economic grouping, should take a look at the list of countries that abstained from voting in the United Nations Resolution that condemned the referendum under which Crimea joined Russia. Prominently featured in that list of 58 abstaining countries are India, China, Brazil and South Africa. Around the same time, the BRICS came out with a joint statement in support of Russia not being excluded from the G20. The implied threat that came in that statement was that the grouping would have been reduced substantially from 20 members and probably become totally irrelevant. At a time when the United States, with the help of its allies, had managed to stoke up tensions in Ukraine and the Middle East, Washington is probably unhappy about a big red presence in the areas which it considers as a part of its sphere of influence under the Monroe Doctrine. Almost all the major countries in South America have a distinct anti-American regime in place, from Venezuela to Bolivia to even Argentina. It’s imperative that the BRICS step up cooperation with Latin American countries and set regular summit-level meetings with Mercosur. This is the region that will most likely offer the greatest amount of support for a New World Order. Dilma Rousseff’s victory sets the tone for the growth in BRICS cooperation as well as the grouping’s expanded engagements with countries that are sick of the Western war machine and its hegemony. South American countries such as Bolivia, Venezuela and Brazil have shown the world that poverty and inequality can be reduced despite slowed economic growth rates. It’s time for the BRICS to take a cue from these countries and work towards a fair and more equal world. Several countries have expressed interest in joining the BRICS. The jury is still out on whether expansion of the grouping is a good idea. It would be wise to keep out politically and economically instable countries, no matter how much strategic value they offer.